Automated processes that allow you to quickly generate different ring layouts and charging patterns to evaluate differences in cost, dilution and break. Aegis Analyser provides a multitude of tools designed to improve blasting results and decrease costs. Seamlessly connected data sources with Studio UG mine planning software and common engine for geological evaluation. The next generation in underground blasting software – Aegis is your ultimate solution for providing interactive and automated underground drill and blast design. The multi-faceted system allows users to rapidly compare different scenarios and generate ring layouts, charging plans and blast designs to paper or directly to compatible drill rigs using IREDES. It can even optimise the ring layout to achieve a desired fragmentation outcome and reduce costs. Other key features that make this the ultimate underground blasting design software is its ability to automatically lay out your entire stope in seconds, its incredible flexibility to easily adjust designs, a few rings or individual holes and charges, as well as its Drop Raise Editor that allows for slot raises to be designed, sequenced and inserted into the drilling plan. This among many other features and benefits makes AEGIS the indispensable tool for any underground blasting professional. AEGIS Designer is an independent standalone product that automatically generates all the drill holes for a stope rapidly and accurately. 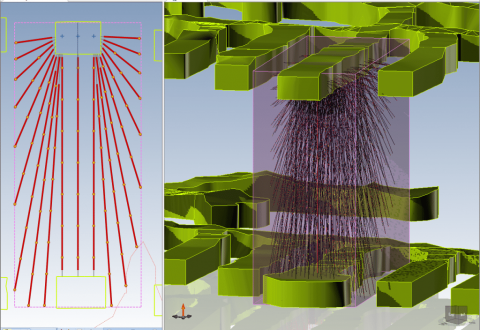 All the user has to do is define the existing voids, geological contacts and optional stope design, then set the burden and toe spacing – a layout will automatically be generated in seconds. Unlike traditional underground blasting software requiring users to start from the beginning if the burden or spacing is adjusted, AEGIS Designer instantly generates the layout using the new values. 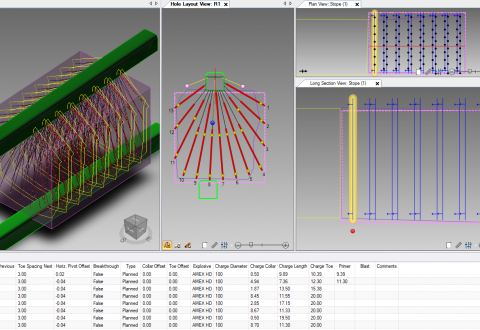 Alleviating this once tedious process will save you time as well as give you the added flexibility of designing rings in four views – plan, section, longitudinal and 3D simultaneously. You will never miss an important detail again. Fast and Repeatable – Automated processes guided by user input parameters deliver consistent designs to site standards. Compare Scenarios – Quickly generate different ring layouts and charging patterns. 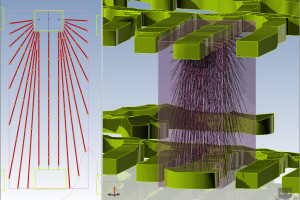 Integrated Solution – Seamlessly connected data sources with Studio UG mine planning software and common engine for geological evaluation. The AEGIS Analyser provides advanced blast simulation and modelling tools for underground engineers which are an important asset in optimising blasting operations. It includes features including break limit predictions, blast dilution analysis and more. Calibrate and estimate excavation break limits using Klein, Holmberg-Persson or Liu-Katsabanis blast energy algorithms. Conduct comprehensive first principles cost analysis for every blast scenario. Compare scenarios for cost and blast prediction to optimise your blasting strategy and improve mine-to-mill performance. Cavity Monitoring Survey (CMS) can calibrate the blast simulation model which can then be used to predict the final excavation break. It can also detail if the fragmentation characteristics of the various rock types are known and the predicted amount of fines and oversize present, allowing the blasting engineer to fine-tune the blast design for optimal results. An exciting and innovative new blasting model technology, the AEGIS Break Analyser uses unit charges and stress reflection methodology in conjunction with electronic detonators to design ring patterns that can transform underground blasting operations into primary crushing operations. With the ability to evaluate explosive energy, shock decay as well the acute characterisation of rock and ore masses in terms of dynamic modulus and strength, the Break Analyser can significantly enhance underground crushing methods to potentially turn them into primary crushing operations. As underground mine operations typically rely heavily upon expensive underground crushers, this has the potential ability to reduce this dependency as the main means of delivering fragmented ore to a mill decreasing overall mining operational costs, whilst increasing operational efficiency. With its intuitive and user-friendly interface, the integration of AEGIS Break Analyser into your mine’s current processes is extremely seamless and non-disruptive. Compare explosive and rock properties to a common base with the Unit Charge model. The unit charge itself is a geometry that includes the detonation velocity of an explosive along with the P-wave velocity of the rock or ore that is undergoing blasting. The Radial Break calculator defines the break potential of an explosive product based on its internal thermochemical energy and the detonation velocity in a diametre of use and borehole pressure. This calculator determines the breaking potential of an explosive product in terms of radial cracks and blasthole expansion. The Break Overlap calculator has been designed to determine whether a blasting pattern has enough coverage from blasthole to blasthole and ring to ring. It can also be used in conjunction with the Radial Break calculator to determine what the correct pattern spacing and burden should be for the radial break chosen. The Blast Design Workflow uses a step-wise process to define inputs that test and compare your trial blast patterns using explosive and rock/ore properties as well as attenuation for your particular rock/ore type.